Florida routinely ranks as one of the most dangerous states in the country for walking. And walking in Orlando is deadlier than in any other major city in Florida — and the nation. 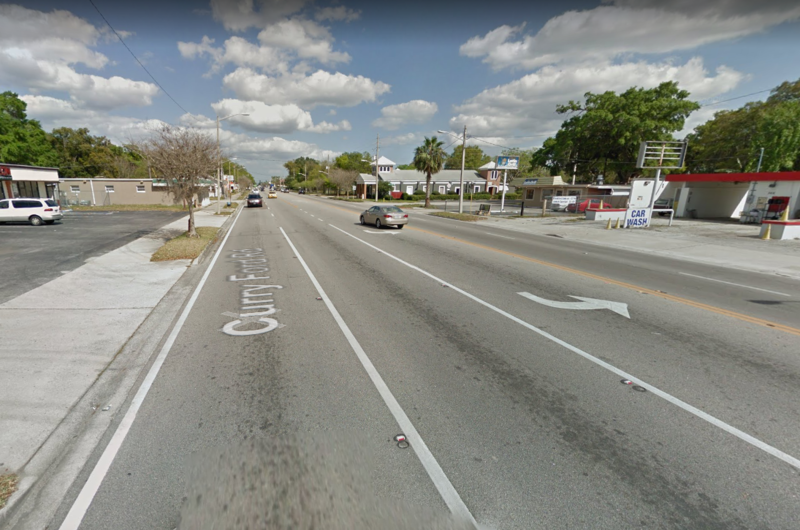 First up is Curry Ford Road, which locals describe as a “race track.” The city is planning to test out a redesign using low-cost materials on half a mile of this four-lane street, according to the Jacksonville-based blog Modern Cities. By trimming it down to two through lanes for motor vehicles with a center lane, the city will have room for curbside bike lanes separated from cars by vertical posts. A similar road diet on Orlando’s Edgewater Drive (without the bike lanes) reduced traffic injuries 71 percent, but that was nearly two decades ago. During the four-week pilot on Curry Ford Road, the city will collect data on safety, vehicle speeds, and walking and biking volumes. If the results show the redesign has made a difference, the city may extend it and make it permanent. Currently, Curry Ford Road is a wide open speedway. In addition to the Curry Ford Road project, Orlando is planning two permanent street redesigns downtown, according to the Orlando Sentinel, but those are capital projects expected to take years to implement. Keep an eye on Hattaway’s initiatives in Orlando. If this city can turn its dangerous streets into safe places to walk and bike, anywhere can. More recommended reading today: The Bicycle Coalition of Greater Philadelphia reports thatMayor Jim Kenney has approved two long-sought protected bike lanes through Center City. And the Dallas Morning News says DART has to take bus service seriously, or else systemwide ridership will continue to decline. Four weeks is too short for any meaningful data collection on a pilot like this. I can’t believe that they’ll reverse it after such a short time (or at all). It occurred to me that this was a way to sell it to skeptics (it’s only a few weeks!) until people see how great it is. true, pretty easy for most places to go more than 4 weeks without a pedestrian death. I hope part of the impact study will be the reduced revenues for business in this corridor. I also am [not] looking forward to the massive traffic jams that will result from vehicles turning from Ferncreek onto Curry Ford only to be gridlocked as people fight to merge at Bumby (since most current-day drivers don’t know how to “zipper merge”). I live in this area. I (used to) walk to the Wawa and the local Mexican restaurant and the Cuban restaurant (not impacted by this project except for traffic jams). I am all for safer streets but it’s the pedestrians who don’t honor the crossing signals and the drivers who don’t care about pedestrian laws. I can’t count how many drivers I watch stop well over the crosswalk markings. The traffic WILL DEF be slower creating more gridlock on both ends of Curry Ford outside of this test portion of the roadway.